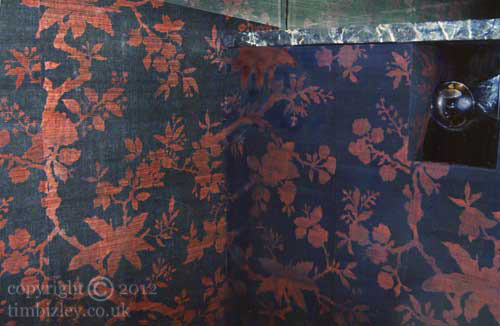 The delicate and ornate paper with a woven surface (on the left hand side of the image) was too fragile to form the splash back which needed to be waterproof and wipeable. A stencil was cut in imitation of the paper and treated with paint effect stries to provide a woven texture which coordinated with the paper and was both durable and washable. The work was undertaken for a private client in London, U.K.